Wed., Dec. 6, 2017, 3:34 p.m.
PARIS – England has become the first country to have five teams in the knockout stage of the Champions League after Liverpool completed a sweep for Premier League clubs with a 7-0 thrashing of Spartak Moscow on Wednesday. Liverpool, which won Europe’s top competition five times, clinched Group E after Philippe Coutinho secured his first hat trick for the club. Liverpool was joined in the last 16 by former champion Porto, Sevilla and Shakhtar Donetsk. Napoli lost 2-1 at Feyenoord and failed to qualify. Liverpool was one of four English teams to top a group, along with Manchester City, Manchester United and Tottenham. Chelsea completed the sweep, signaling a revival by English clubs after years of underachievement since the west London club was European champion in 2012. Needing only a draw to qualify, it was all too easy for Liverpool at Anfield, where Coutinho led Liverpool’s dismantling of Spartak with two goals in the opening 15 minutes before completing his first hat trick for the Reds in the 50th. 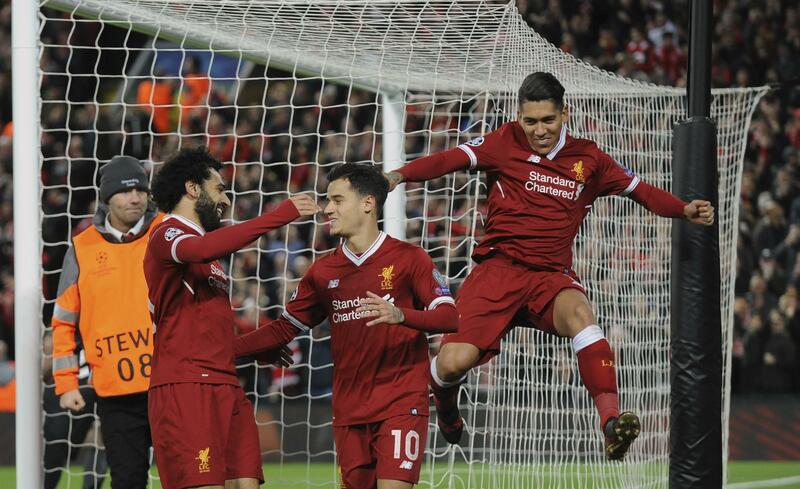 Roberto Firmino, Sadio Mane (2) and Mohamed Salah scored the other goals as Liverpool won 7-0 for the second time in Group E and topped it by three points from second-place Sevilla. Spartak finished in third place and dropped into the Europa League. Liverpool finished the group stage with 23 goals, just two goals shy of Paris Saint-Germain’s record of 25 this season. Sevilla qualified for the knockout phase with a 1-1 draw at Maribor. In freezing temperatures, the Spanish side started poorly but recovered after the interval and equalized through Ganso to clinch the runner-up spot. Shakhtar Donetsk advanced to the knockout stage with a 2-1 victory over Manchester City, ending the English club’s unbeaten record in all competitions this season. Already guaranteed first place, City was caught on the break and failed to become only the seventh club in Champions League history to win every game in the group stage. Shakhtar, which finished runner-up, took the lead in the 26th minute when Bernard cut in from the left side of the box and curled a shot inside the far post, beyond the reach of goalkeeper Ederson. Eight minutes later, Ismaily sprinted to beat Ederson to the ball before rounding the keeper and stroking a shot into the unguarded net. City’s consolation goal came in added time when Sergio Aguero converted a penalty. It was City’s first competitive loss since being beaten by Arsenal in an FA Cup semifinal in April. In the group’s other game, Feyenoord rallied from a goal down to beat Napoli, which failed to join Serie A rivals Juventus and Roma in the knockout stage. Napoli ended third and headed to the Europa League. Vincent Aboubakar scored twice to ensure Porto reached the knockout stage with a resounding 5-2 win against a poor Monaco side. Both teams finished with 10 men after having a player sent off late in the first half. Turkish side Besitkas, which won 2-1 away to Leipzig, finished top of Group G with 14 points. Porto has 10 and Leipzig will play in the Europa League. Monaco reached the semifinals of the competition last season by playing some scintillating attacking football. But it has been a very different story this season for the French champion and coach Leonardo Jardim’s side was already guaranteed to finish last. Cristiano Ronaldo became the first player to score in all six group-stage matches of the Champions League as Real Madrid beat Borussia Dortmund 3-2. Madrid had already guaranteed second place behind Group H winner Tottenham, which defeated APOEL 3-0 at Wembley Stadium to reach 16 points and finish with more points than any other team in the group stage. Madrid ended with 13 points, and Dortmund and Cypriot club APOEL finished with two points each. The German club took third place because of a better goal difference and will now play in the Europa League. Madrid led 2-0 after Borja Mayoral opened the scoring and Ronaldo, the all-time leading scorer in the Champions League with 115 goals, netted his ninth in the competition this season. The strike also drew him level with Lionel Messi on 60 all-time goals in the group stage. Dortmund equalized with two goals by Pierre-Emerick Aubameyang, one in each half, but Lucas Vazquez got the winner in the 81st minute at the Santiago Bernabeu Stadium. Published: Dec. 6, 2017, 3:34 p.m.